Do you have many digital photos? PixFiler Picture Organizer makes it easy to catalogue and share your photos. Annotate and categorize your photos. Locate and show any photo in seconds. View thumbnails. Create insert-and-run CD of selected photos. Automate creation of web-pages. Print thumbnails, photos, and reports. Send pictures as email. View EXIF metadata. Convert and resize your photos. See location on a map. Supports most graphic formats. A quick and easy program to help you catalogue your digital photos. 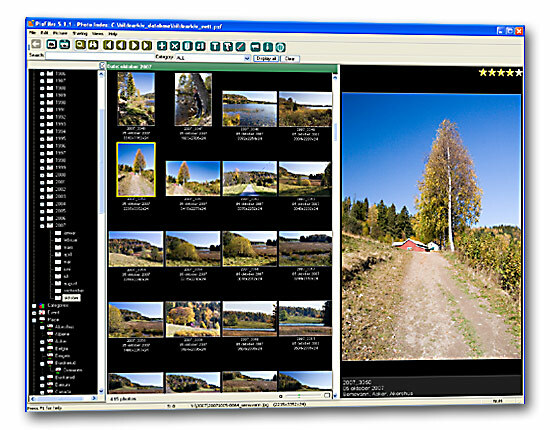 ...... Automates creation of simple web-pages so the whole world can see your photos. Print your photos on your printer. Select 1, 2, or 4 photos on each page or print contact sheets. Copy and convert many image files at once. Resize your photos quickly. Send pictures as email. View EXIF metadata. See location on a map. If you store your photos on CD, PixFiler will keep track of your CDs and tell you which CD to insert. Thumbnails will be stored on your hard disk so you can display thumbnails without having to insert the CD. Powerful features to annotate your photos. Add the same text to many photos in one operation. Import annotations from text files. Export data from PixFiler to use them in other programs. Supports BMP, JPG, TIF, GIF, PCD, PSD, PNG, PCX, TGA, CRW, NEF, RAF and several other graphic file formats (totally 20 formats). Reads RAW format files formore than 100 digital cameras. Organizer favorite car models, car dealers. Create meaningful photo collection(names+folders).Exif filter,duplicates +more. Picture2Web provides a single click solution for creating a web picture gallery. Convert BMP, JPEG, GIF, PNG, TIFF, WMF, EMF, EXIF & ICO format picture to AVI. AOK MP3 Organizer, the best way to store, search and sort your music. Qweas is providing links to PixFiler Picture Organizer 5.3.3 as a courtesy, and makes no representations regarding PixFiler Picture Organizer or any other applications or any information related thereto. Any questions, complaints or claims regarding this application PixFiler Picture Organizer 5.3.3 must be directed to the appropriate software vendor. You may click the publisher link of PixFiler Picture Organizer on the top of this page to get more details about the vendor.